The Sony Open will be played in Miami March 18 through March 31 at the Crandon Park Tennis Center. In anticipation of the 2013 Sony Open, the tournament has released the men’s and women’s entry list. Novak Djokovic, the 2013 Australian Open champion, returns to Miami to defend his 2012 title. Djokovic is looking for a place in the record books by attempting to win three straight Miami titles. The only player to have won the title three years in a row is Andre Agassi (2001 – 2003). Also joining Djokovic in Miami are Andy Murray and Rafael Nadal. Absent from the roster this year is Roger Federer who has decided to limit his play in 2013 and in the process will be skipping the Sony Open. On the women’s side Victoria Azarenka, the 2013 Australian Open champion, will be looking to add another title in Miami. Azarenka has won the title in Miami on two occasions. Agnieszka Radwanska will also be in Miami attempting to defend her 2012 Sony Open title. Maria Sharapova and Serena Williams also highlight the women’s field. 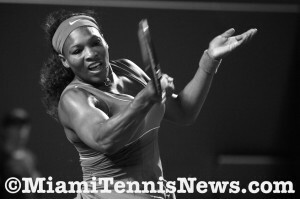 A title in Miami by Williams will break the record for most titles by a women in Miami. Williams is currently tied with Steffi Graf with 5 Miami titles. Reigning Grand Slam Champions Djokovic, Nadal, Murray, Williams, Sharapova and Azarenka all entered to play. 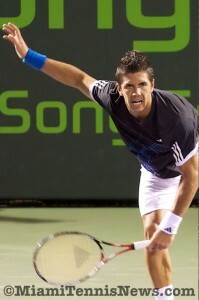 MIAMI, Fla. (www.sonyeopentennis.com) – The ATP and WTA entry lists for the 2013 Sony Open were announced today and the tournament will once again feature a Grand Slam caliber player field. Each spring the Sony Open brings the greatest tennis players in the world to the Crandon Park Tennis Center and 2013 is no different. The Sony Open field features several Grand Slam champions including reigning singles champions Novak Djokovic (Australian Open), Rafael Nadal (French Open), Andy Murray (US Open), Victoria Azarenka (Australian Open), Maria Sharapova (French Open) and Serena Williams (Wimbledon and US Open). 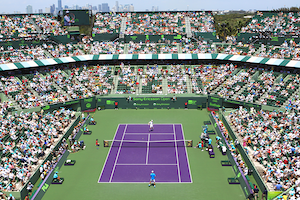 Tickets to the 2013 Sony Open, which will be played March 18-31 at the Crandon Park Tennis Center, are on sale now and can be purchased by phone (305-442-3367) or online at www.sonyopentennis.com. An electrifying two weeks of tennis conclude with the women’s final on Saturday, March 30 and the men’s final on Sunday, March 31. Qualifying rounds will be played March 18-19 and will determine 12 more slots in each singles draw. The tournament will also award wildcards to five men and eight women. The main draw begins on Tuesday, March 19 as the women take the court, followed by the beginning of the men’s main draw on Wednesday, March 20. Djokovic returns to Miami seeking a three-peat, having won the trophy in 2012 and 2011. He brought home his first Sony Open title in 2007. On the women’s side, 15-time Grand Slam champ and Olympic Gold Medalist, Serena Williams returns on a mission for a record-breaking sixth Sony Open title, but both contenders will face a tough field in their quest for Sony Open history. On the men’s side, 11-time Grand Slam champion Rafael Nadal, recently made his return to the court and is entered to play his 10th consecutive Sony Open. Nadal, a three-time finalist, will attempt to capture his first title on the purple courts. Andy Murray, the 2009 Sony Open champion, will look to bounce back from last year’s final appearance and take home the coveted trophy. The women’s field is also extremely competitive, featuring American Sloane Stephens, who made her first Grand Slam semifinal appearance this year, which included a win over Serena Williams at the Australian Open. Two-time Sony Open winner Victoria Azarenka, comimg off here second consecutive Australian Open title, seeks her third Sony Open title in five years. Also a favorite to capture her first Sony Open title is the ever-popular Maria Sharapova, who last year completed the career Grand Slam with her French Open victory. With such a tremendous player field one might forget that the Sony Open is more than just tennis and has become the standard for first-class sporting events. High fashion, great food, fabulous shopping and celebrity musical performances have made the Sony Open the most glamorous stop on tour. Come see why huge crowds as well as the biggest names in music, entertainment and sports visit the Sony Open each March. Get your tickets today. The Sony Ericsson women’s final turned out to be a three set skirmish between Serbian Jelena Jankovic, the fourth seed and Serena Williams, the eight seed. Despite Jankovic leading 3-2 in their head to head, Williams, as the defending champion, was the favorite. Unworthy of being labeled a classic, but Williams hung on to win 6-1, 5-7, 6-3. Looking fitter than last year, Williams was smoking with seven winners in the first two games. With Jelena having difficulty with her first serve, Williams pounced on the second. For her part, Williams was deft at coming up with powerful and well-placed serves, essentially service winners. At this juncture, Jankovic’s strategy of concentrating on Williams’ forehand, the unsteadier shot, was unsuccessful. In the sixth game, after Jankovic kicked in her second double fault, Williams cashed in on a double break point opportunity and went up 5-1. Then, Serena put away an overhead and served an ace placing punctuation on the first set 6-1. In the second set, with Jankovic serving, a series of unforced errors permitted Williams to take a 1-0 lead. Unwilling to resign herself, Jelena produced a wry smile in an attempt to diffuse the stress. But, Williams continued to apply pressure, going up 3-0. With Serena up a double break, it appeared that the Serbian would make a prompt exit. Yet, in the fourth game, with a beautiful backhand winner down the line, Jelena had triple break point, she narrowed the gap 3-1. A jubilant crowd, craving more tennis, acknowledged her effort with a standing ovation. Subsequently, Williams had three break chances, but great defense by Jankovic, including a split on the hardcourt, stopped her from converting. 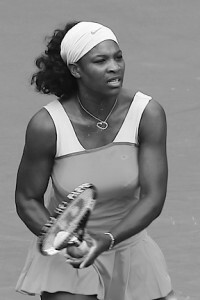 Nevertheless, in the tenth game, Serena had the championship on her racket. Williams double faulted and missed two uncomplicated volleys to extend the match 5-5. Once again though, Serena had multiple break opportunities, but with two first-class first serves, Jelena got it to deuce. Disgusted, Williams began to ramble then splayed another error gifting Jankovic the game. At 5-6, Serena tried to prolong the set with a tiebreak. Akin to the first, the second set ended with a double fault, this time from Serena. Could this be a reversal of fortunes? Last year, Justine Henin breezed through the first set. Henin was serving for the match when Williams broke her, stole the second and eventually grabbed the title. With momentum clearly on the Serbian’s side, Williams rebounded nicely in the third set. After squandering a 15-40 lead and giving Jelena a game point with her 36th unforced error, a despondent and frustrated Williams produced a great defensive backhand pass and an overhead winner to secure the break. Play was paused briefly when Jankovic called for the doctor because she felt “lightheaded [and her] head is going to explode”. A moment of lighthearted banter occurred when the physician asked Jankovic if she was on antibiotics. Jelena replied, with a twisted grin: “don’t you remember, you gave them to me”. When play resumed, Serena widen her lead 5-0. But, the scrappy, ever resilient Serb overcame a match point and managed to break 5-1. In the longest game of the match, 17 points, Jelena saved a championship point and needed five deuces before winning it. As Serena served, with her 43rd winner, she had triple championship point. But, she was denied by a combination of double faults, miss timed forehands and over hit volleys. Incredulous of the unfolding scenario, Serena let out a piercing scream. Quickly though, Serena erased any vision of her poor play with three consecutive winners which gave her triple break point. After shanking two returns, Williams put away an overhead and consolidated the win 6-3. Although Serena had three times as many winners (48 to 16), she produced 55 unforced errors while Jankovic had far fewer. Jelena managed to keep the match close by saving 14 of 22 break points and converting 5 of 10 break chances. By prevailing, Williams earned her fifth Miami trophy, tying her with Steffi Graff as the tournaments’ foremost winners.